These birds were really celebrating the unique date on the cancels, 11-11-11. What a tremendous journey they had while dressed in the finest double twisted ring postmarks, all the way from Montagu Est, Newcastle Upon Tyne to China.... and back again, and still in good condition. The first stamp is from 1989 RSPB set , 32p Eurasian Oystercatcher (haematopus ostralegus). 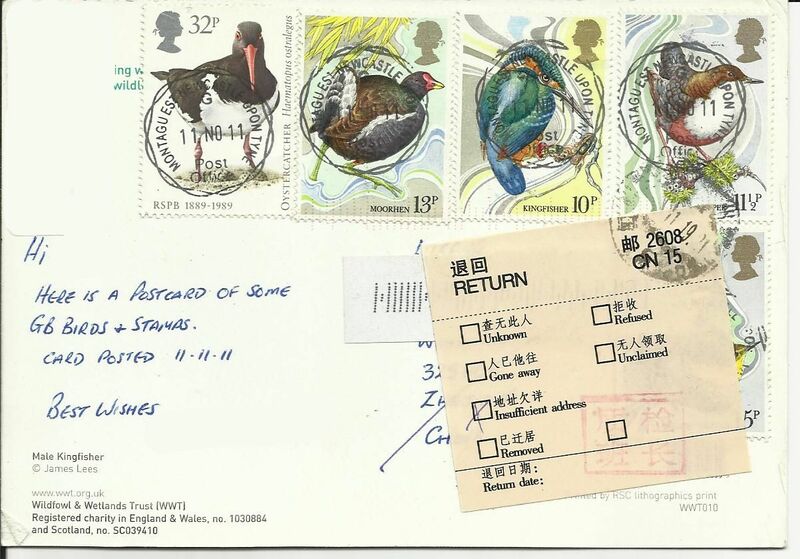 The other birds are from the 1980 4v set issued for Wild Bird Protection. 13p Common Moorhen (Gallinula chloropus),10p Common Kingfisher (Alcedo atthis), 11 1/2p White throated dipper (Cinclus cinclus). The bird covered by the RTS label is the Western Yellow Wagtail (Motacilla flava).